The Hotel Servigroup Torre Dorada is a fairly modern looking hotel which has recently undergone extensive refurbishment. The hotel consists of 243 guest rooms, most of which have brilliant views. The hotel is in a great position which allows you views of the sea and mountains. All of the rooms have air conditioning, well equipped bathroom, telephone, satellite TV, safe, balcony and heating as standard. Some of the rooms also have brilliant views of the sea, or mountains. The hotel itself is located in a fairly quiet residential area just outside of Benidorm, however it is fairly easy to get to the centre of the town with a short walk to the bus stop. 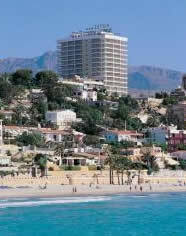 It’s a short 200m walk to Poniente Beach which is a lovely blue flag beach with a promenade and plenty of palm trees. This hotel is ideal for families with young children because of the facilities provided, and how caring the staff are. There are two separate swimming pools, one large one for adults, and another one for children to splash around in. ( check pricing and availability here… ). There is also a sun terrace where you can relax and soak up the sun’s rays, there are plenty of sun beds and parasols to go around. The hotel also has a very nice garden, and a children’s playground. This hotel has many features to keep your children happy! During the peak season children will enjoy the mini-club which is full of blackboards, paintings, workshops, music, and films that children will really enjoy. Your children will be looked after by professional staff, so you know that they are in safe hands. You can leave your children in one of these mini-clubs and then go off and enjoy some time by yourself! For adults there are also a number of different entertainment programs and things to do. There are plenty of shows and live performances to keep you entertained at night. They run some form of event on most nights. This hotel also offers free dance lessons through the Servigroup Dance Academy scheme. These free dance classes are taught by professional dancers. It is worth noting however that these free dance lessons are at the Servigroup Orange hotel. This hotel is designed to make your stay as comfortable and enjoyable as possible, there is everything that you could ever want in this hotel. The food served at this hotel is very high quality and very good value for money. There is a lot of choice and you won’t be disappointed even if you go full board. The hotel and rooms are kept very clean and tidy, rooms are cleaned on a daily basis. All of the staff are helpful and will go out of their way to help you with even the smallest of requests. The staff, particularly the waiting staff are very good with children. This is a lovely hotel where the staff genuinely care about you and will look after you very well. If you want to have a relaxing holiday then you should consider the Torre Dorada.